A few years ago I had the pleasure of reviewing the Arte dei Suonatori ensemble’s recording of this same repertoire from the BIS label (see review). While I am aware of a number of alternatives, this has remained one of my favourite versions of Handel’s Concerti Grossi Op. 6 when it comes to the ‘authentic’ early music approach. Arte dei Suonatori enrich their sound with the plucked resonance of an archlute, as well as giving the strings extra oomph with a chamber organ to provide contrast from the more familiar harpsichord continuo. The Combattimento Consort sound is a touch crisper in general, with greater weight to the massed string sound and the added continuo frills having less weight and impact as a result. The harpsichord is not particularly high in the recorded balance and neither is the organ or chitarrone. This is indeed as it should be in a typical concert setting, and the sonic perspective is rewarding and realistic. The concerti 1, 2, 5 and 6 also have oboes and bassoons added, which adds another refreshing but quite subtly treated contrast to the set. Without taking on a blow-by-blow comparison, the set you will prefer depends on your taste in terms of sound - both versions being to my mind satisfying in their own right. Arte dei Suonatori has less robust string tone, conjuring a sense of more stately elegance and intimacy in a chamber setting, for instance in the opening of the Concerto Grosso No. 1, acquiring drama in hushed suggestiveness even when the faster tempo kicks in the second Allegro e forte movement. The Combattimento Consort is grander and more imperious in this striking opening, creating greater dynamic contrast between the tutti and solo sections and providing taught textures in that driving second movement. This a generalisation but these are typical differences between the two sets, and all reasons I’m happy to hang on to both. 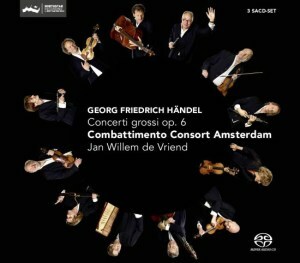 Performances from the Combattimento Consort Amsterdam are excellent throughout in this Handel Op. 6, and my interest was held at every point. The ensemble and soloists relish the gorgeous suspensions and dissonances in these works, and Handel’s little quirky little moments of general shaking and ornamentation are done marvellously. Dramatic passages such as the Largo of the Concerto Grosso No. 2 are given pretty extreme treatment but nothing which goes beyond the idiomatic pale, taking on more the characteristics of Vivaldi or Biber in exploring Handel’s inventiveness with his strings. If it’s bagpipes he has in mind for instance, such as with the Polonaise of the Concerto Grosso No. 3, then it’s bagpipes you hear.Counterpoint is presented with animation and stylish consistency, attention is paid to colour and detail, and the sense of commitment from all concerned leaps out from your speakers the whole time. There are some striking special effects as well. Have a listen to the first movement of the Concerto Grosso No. 6 and revel in that remarkable moment 50 seconds in where Handel almost meets Petrushka.Subtle tenderness is a great strength to go along with all of the acrobatics and energy, the opening of the Concerto Grosso No. 7 just one of many points of melting beauty and affecting musical expression. With excellent notes, scholarly but approachable annotation and a short comment on each concerto individually, the booklet also reveals changing soloists with the violin duos between each concerto. You won’t however be struck by any shift in standard or intrinsic qualities, and I can’t say I noted any particular favourites. Stirring, exciting and moving in equal measure, this is a Handel Op. 6 with which to reward yourself, and which will deliver pleasure for as long as you possess it. I’m not sure how many recordings this team is making or still has in the can, but with Jan Willem de Vriend leaving the ensemble to pursue his blossoming career as a conductor we have to wait see what will happen in the future. Such a magnificent production, superbly recorded and excellent both in plain stereo and startling SACD, is therefore cause both for celebration and poignancy. Snap it up while you can.